Winter in Minnesota. It’s inevitable. Hot chocolate, cold temperatures, hockey season, the whole deal! We will have snow and cold here in the Twin Cities and around the state, there’s no avoiding it. I’ve been asked a few times this fall, what I will do when winter gets here? I’m a traveling photographer in Minnesota who specializes in outdoor and location portraits. Do I quit shooting in the winter? Heck no! I’ll do the same thing I always do in the winter, keep having a blast shooting outside. Especially if you are planning multiple outfits. Give yourself a base layer of clothing, just like you would if you were going outside in the winter for any other activity. Then layer your portrait clothes over it. Even if you plan on having your portraits in your jacket, having an extra layer is the key to being comfortable. Plan portraits that focus around an activity. Building a snow man, sledding, skating, sitting by a bonfire. They all make fort a great portrait session. I look for locations where it’s easy to move around and stay warm outside. You can also choose to do indoor winter portraits at home. Doing a cozy activity like making cookies, story time, or decorating the tree create a unique personal photography session for your family. Laura and Robert’s Hockey Engagement at their favorite ice rink in St. Paul, MN. Know what a safe temperature is for outdoor activities. Yes, this is Minnesota, we go out and shovel, snowmobile, ski in all sorts of weather, but for photo shoots I follow the same temperature guidelines as local schools do for outdoor recess- 20 degrees or above for outdoor winter portraits. I also plan photography sessions for my clients’ comfort levels. 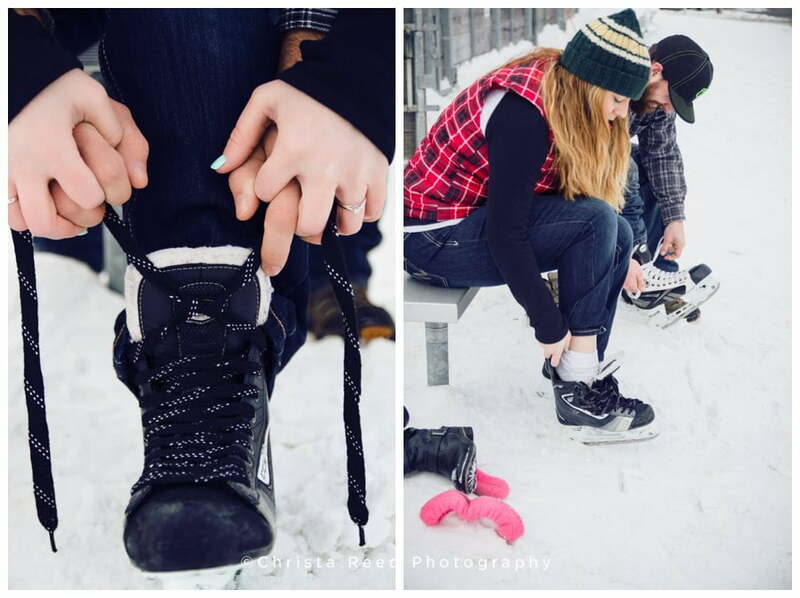 If we’re doing an outdoor shoot snowmobiling with adults or teens we’re a little more flexible on temperature than when we’re doing family portraits with kids. I take that into account when planning. Sometimes we have to move sessions around in the winter for temperature and snow, just like when it rains in the summer. Weather happens, and it’s okay! It’s worth it for beautiful outdoor portraits. It’s not something I stress about, I just plan for it. I use a lot of the National Weather Service forecast tools to pick days that have the lowest probability of winter weather hazards. Christmas Card Portraits on a chilly November day, dressing in layers and putting coats on between shots. Schedule portraits not far in advance. I tend to schedule winter sessions only 1-2 weeks in advance, so we can see the weather forecast when we schedule. If we know the next week will be cold and snowy, we can book farther out. Usually a snowy week is followed by a break to nicer weather. In the summer I am booking 3-4 weeks out, in the winter because I do have less weddings and portraits it’s okay to be more last minute about our schedule. Do family portraits at home. Portraits for an engagement, a new addition to your family, new portraits for you business should be done when these life milestones happen. 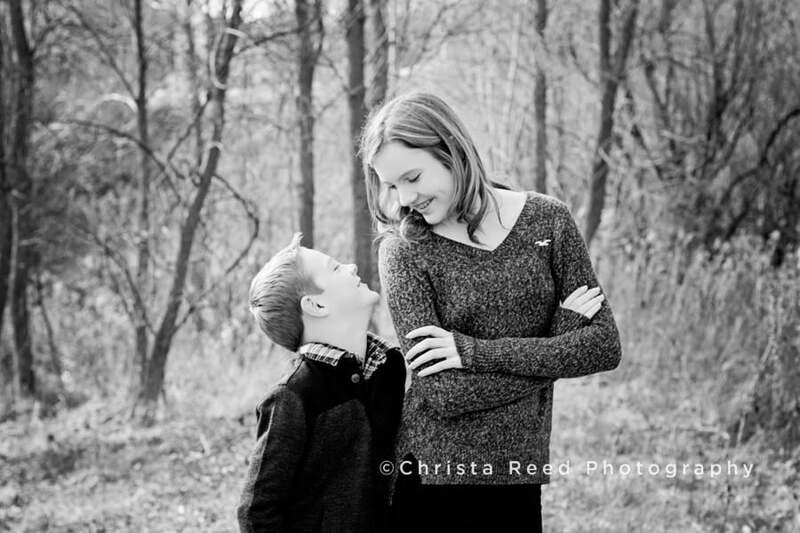 For families I recommend winter portraits in your home. You can plan a fun activity like story time or baking cookies with older kids. Baby and newborn portraits can easily be done in your home, so you get pictures of the nursery and interaction with your infant. This also saves you the hassle of packing the diaper bag and driving in the snow. Choose a warm and sunny spot for engagements. For engagements and head shots, Como Conservatory is one of my favorite winter spots. It’s warm and bright no matter how cold it is outside. Finding indoor locations for portraits is an essential part of my job. I keep a list of photographer friendly indoor spots around the Twin Cities, and when you book we can choose a place you will enjoy. 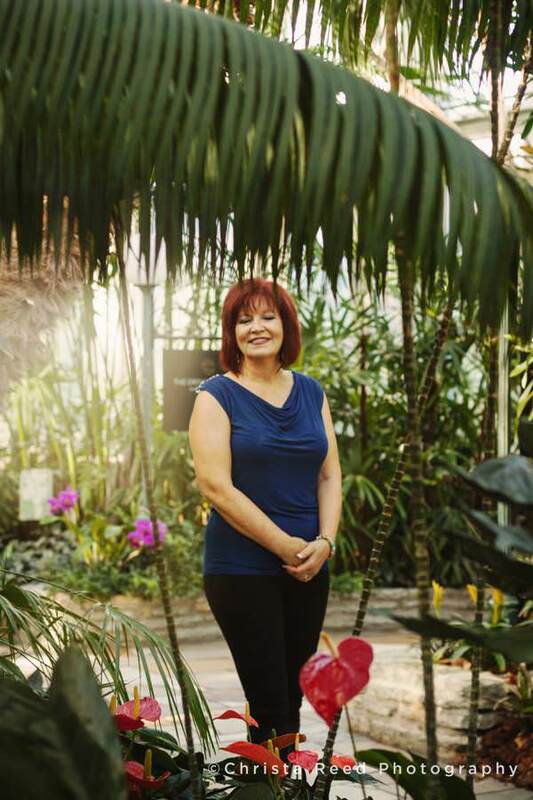 It was below zero when we did creative portraits and head shots for Julie at the Como Conservatory. If you like playing in the snow, contact me and let’s plan your perfect winter portrait session!